Sega Flash Vol. 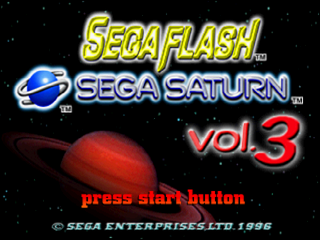 3 is the third demo disc in the Sega Flash series. It was released in 1996. Vol. 3 adopts a different presentational style to prior volumes, a style which would stick with the four volumes which followed. It contains four playable demos, however Sega Worldwide Soccer '97 is identical to the demo seen in Sega Flash Vol. 2 (though the title screen and in-game music has been removed). Daytona USA: Championship Circuit Edition forces the player to drive the standard Hornet car around the Dinosaur Canyon track, again without music. Cyber Troopers Virtual-On has music, but only allows the player to fight one enemy, and Tomb Raider covers the first stage of the game, with menus and options being stripped out. The videos are full-screen and are no-frills demonstrations of gameplay footage. In the United Kingdom this was released with issue #15 of Sega Saturn Magazine. A bug causes Saturns to freeze if the disc be played for three hours - supposedly was only discovered by Sega after the discs started being pressed but before shipment.